This is a review of the supplement PrimaForce KetoShakes, manufactured by the company PrimaForce Supplements. This product claims to assist with weight loss, as well as fat oxidation, while at the same time advancing metabolism levels. More so, this supplement is claimed to suppress appetite, while maintaining satiety. In addition, it is claimed that this slimming product assists in inducing ketosis, if combined with a low-carb diet. Read on for more. The manufacturer recommends taking half-a-scoop (to test for tolerance), daily, increasing to one (1) scoop of powder, mixed with six to eight ounces of water. This may be adjusted to taste. The mixture should be stirred well, and consumed slowly. For extra calories, and if wishing to keep macros accurate, substitute cream for the water. The manufacturer does indicate that this product is best taken in the morning, and as a meal replacement. In addition, the manufacturer states that, for best results, this product should be combined with a ketogenic or low-carb diet, as well as an exercise program. The manufacturer suggests that consumers first speak to a health-care provider, before taking this product: gastrointestinal discomfort may be experienced. A 21.9-ounce (62-gram) container of this slimming product is available directly from the manufacturer on their website, or from various third-party dealers. The purchase price is listed at $69.99 (no discounts offered). There are also no package deals offered. There is a 30-day money-back guarantee on this product. However, to validate the refund, the goods 1) must have been purchased within 30-days, 2) must be unopened and in the original packaging, 3) must be returned after emailing the company for information on the return process, and 4) will attract shipping and handling fees when returned. There is an absence of reviews on this product. For instance, no reviews are listed on the third-party site, Amazon. 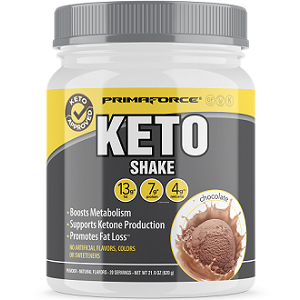 PrimaForce KetoShakes is formulated to suppress hunger cravings, burn fat, and increase weight loss. This meal-replacement product comes with very clear dosage instructions, leaving the consumer in no doubt as to consume for best results. Another benefit of this product is that it contains no artificial ingredients. That said, our research found some concerns. We were unable to find reviews on this product. Neither the company’s website, nor even Amazon offers reviews. Such reviews are a valuable source of information on the reaction of the consumer to a new product. However, personal short- and long-term benefits are not provided. This leaves the potential buyer having to trust the claims of the manufacturer, rather than the views of those who have tried the product. The company does not provide a range of purchasing options, with discounts for bulk buying this product. The buyer will therefore pay more over the long term to maintain health. As such, it might be better, especially with so many other products on the market to opt for one that offers better quality at a lower price. John Parker	reviewed PrimaForce KetoShakes	on May 20th	 and gave it a rating of 3.